But before we jump back in, I am really pleased to announce that I’ve persuaded George Gilder, one of the finest thinkers and philosophers I know, and Stephen Moore, contributing editor to the Wall Street Journal, along with Grant Williams of Things That Make You Go Hmmm... fame to speak at the 11th annual Strategic Investment Conference in San Diego May 13-16. They will join Niall Ferguson, Kyle Bass, Newt Gingrich, Ian Bremmer, David Rosenberg, Dr. Lacy Hunt, Anatole Kaletsky, Patrick Cox, Dylan Grice, David Rosenberg, David Zervos, Rich Yamarone, my Code Red coauthor Jonathan Tepper, Jeff Gundlach, and Paul McCulley. Nothing but headliners, one after the other, for 2½ days. Plus some of the best money managers around, some names I hope to confirm within the next few weeks, and one or two people who are trying to figure out how to change their schedules in order to get there and who will be fabulous surprises for the attendees. By the way, many of the speakers are planning to hang around and listen to the other speakers. This means you will have chances to engage them at the lunches, dinners, and breaks. Most speakers simply fly into a conference and fly out, but my conference is little different. This is an annual gathering you simply don’t want to miss. I can’t think of any conference anywhere that has a lineup this strong. When I first broached the idea of our conference to Jon Sundt, the founder of cosponsor Altegris, the one rule I had was that I wanted the conference to be one I would want to attend. The usual conference boasts a few headliners, and then the sponsors fill out the lineup. I wanted to do a conference where no speaker could buy his or her way onto the platform. That means we often lose money on the conference (hard as that may be to imagine, at the price, I acknowledge); however, the purpose is not to make money but to learn with – and maybe have some fun with – great people. We do put on a great show, and my partners make sure it is run well. But the best part will be your fellow attendees. A lot of long-term friendships are forged at this conference. You can learn more and sign up at http://www.mauldineconomics.com/landing/sic-2014 . I can add a few more constructive comments. First, the Wikipedia definition of Keynesian economics that John cites misses the most important element of the Keynesian approach, which is the assumption that in periods of recession markets do not clear. Keynesians assume that prices are “sticky” at least downward, leading to excess supply during periods of recession. Downward price stickiness is and always has been the central tenet of the Keynesian approach. There is very little direct evidence to support it. Mark Bils and Pete Klenow, for example, have shown that prices move around far too much to be consistent with the Keynesian assumption of “sticky” prices. However, there is a strong indirect piece of evidence, which motivated Keynes himself, that in recessions there are idle productive resources, both capital and labor, willing to work at the going price and that therefore should be employed but that nevertheless remain idle. That strongly suggests that prices are not moving fast enough to clear the market, as Keynes assumed. Net worth cannot decline indefinitely, nor can debt rise indefinitely relative to income. While households may initially choose to respond to lower income growth by reducing saving growth rather than reducing consumption growth this choice is not sustainable over some horizon: eventually rising debt forces households with lower income growth to cut back consumption to satisfy their intertemporal [basically, relative-value choices] budget constraint. You almost never see anything written by left-of-center folks on reforming the public schools. And I have noticed on TV talk shows that it's almost impossible to get liberals to agree to the most modest of all reform ideas: getting rid of bad teachers and making sure we keep the good ones. I leave next Wednesday evening for Argentina for 12 days, then return home for eight hours before I take off for 12 days in South Africa. I’m going to try something new this trip and post a few pictures and comments to Twitter. Follow me if you like. After South Africa I’m back home for like a day before I have to run up to New York to do some videos. Then it’s back home for a few weeks (or so it appears) before I head to Amsterdam, Brussels, and Geneva. I’ll come home for a few days and then hightail it to San Diego for our Strategic Investment Conference – one of my real highlights of the year. And then – where were we? – ah yes, I’ll be home for more than two whole weeks before heading to Tuscany for a few weeks of vacation. Whew. I will be ready to relax at the end of all that travel. Today was all about the one-year birthday party of my granddaughter Addison Porter. It was held at my apartment, since there were lots of family member and friends who wanted to help us celebrate the event. Given the occasion, I thought it would be appropriate to play Disney family tunes over the sound system. My own kids grew up with Disney music, and I’ve learned to appreciate it. A very special tune came on – one of my favorite songs of all time. We know it as the introduction and ending to the Disney movie Pinocchio. It’s Jiminy Cricket singing “When You Wish upon a Star.” If you listen to it, notice that the books Jiminy Cricket is leaning against as he sings are Peter Pan and Alice in Wonderland – and this was prior to Disney’s actually turning them into movies. The singing is done by Cliff Edwards, who was known as Ukulele Ike. His lilting falsetto created a song sensation that the American Film Institute says is the seventh-best movie song of all time and easily the top Disney song. Edwards was quite popular back in the ’20s and ’30s, and his number-one song was “Singing in the Rain.” Sadly, he had a troubled life and ended up broke, a welfare patient in a California nursing home. That said, he left us one of the most beautiful melodies of all time. Just a little nostalgic trivia brought on by a granddaughter’s birthday. And yes, she is gorgeous. My daughter Amanda mischievously placed a small cake with lots of pink cream icing on her lap and let her explore the icing and cake with her hands, which of course ended up all over her face, giving everyone great photo opportunities. And now when I wish upon a star, I will think of Addison and that icing-splattered face. March 25, 2014, 10:13 a.m.
You correctly point out in your article that correlation is not causation. Yet you seem to forget that statement, when you cite your beliefs about the source (causation) of income inequality. 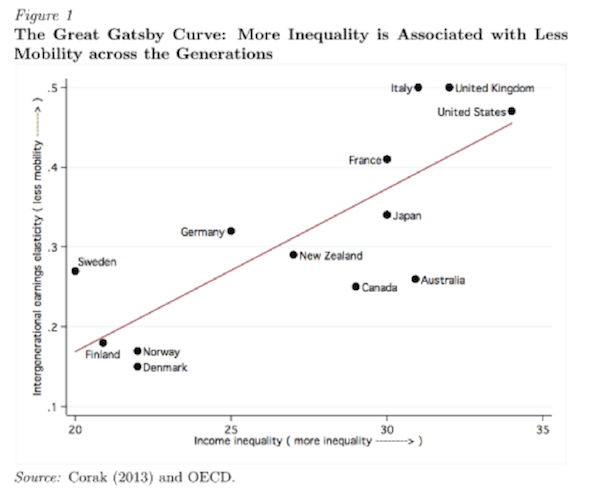 “If we want to do something about income inequality, perhaps we should think about the data that shows the remarkable correlation between education, educational opportunity, and income.” Or that of others that you site, Goodman for example: “If you care about those at the bottom then you are wasting your time and everyone else’s time unless you focus on one and only one phenomenon: the inequality of educational opportunity.” You can’t have it both ways. Either correlation is causation or it isn’t. It isn’t. It is nothing like causation. Not even if it is “remarkable correlation.” There is also the use of the word “explains” when many conservatives talk about income inequality. As in, for example: “Educational inequality explains 80% of income inequality.” I’m not sure what “explains” means here, but I’ll tell you, it doesn’t mean “causes.” Let me give you a simile: the geocentric model of the behavior of planets and stars explains 95% of their movement. Explains is not causes in this example, as it isn’t in the above, but it is a remarkable correlation, no? What I sense here is the Herculean effort to explain income inequality by anything other than how that income is distributed. March 19, 2014, 1:17 p.m. I read your “Thoughts” of Mar 16 with great interest. The data (and especially the charts—the singular tool for forcing information into my poor brain) were very welcome. First, and foremost, in regards to the Goodman excerpt: I am a member of the left (how far? on a scale of 1 to 10, right and left, with 0 as purely independent, I’d say about L6). I do not wish government to be any stronger than is necessary to curb the natural tendency of some individuals (some with extraordinary powers of intellect or charisma, some with a great lack of empathy) in in a narcissistic quest for riches/power/fame, to cause harm to more ordinary individuals who search only for some contentment and greater success for their children. I don’t know how strong government must be to attain that end; I do know that some in government are the very narcissists that trouble private life (take, for instance, Vlad Putin). Second, I do think that the single most important factor acting (causal) toward upward mobility for any child is the attitude of the parent(s): their wish and constant pressure toward instilling in their children a desire to learn and produce. 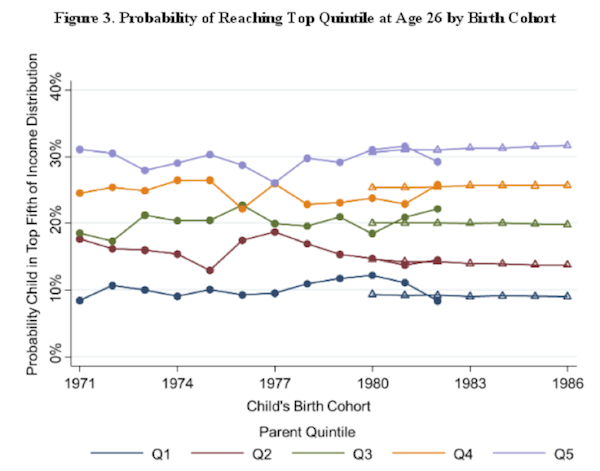 That said, I see that there are myriad factors working against parents achieving that end. Poverty, in a family where all care-givers are forced to work multiple jobs and lack time or energy to interact with children is another. Extreme poverty when the parent’s skills, combined with economic conditions make earning enough to feed and house children impossible requires some kind of relief. Sufficient relief to afford necessities is humanely necessary, but culturally insufficient. Add lack of medical care, poor education, lack of personal security—for parents as well as children. Children with special attributes—sixth sigma intelligence, physical ability, musical talent, etc.—will be more likely to progress, but the remaining five sigma are left increasingly behind. Yes, the situation is complex and complicated. The solution is a multiplicity of integrals of an nth order equation with unknown constants and multiple variables. It may be that the solution will never be perfectly reached. The Biblical passage “The poor you will always have with you” may be a reality, but it doesn’t mean we shouldn’t do our collective best to reduce their proportion in societies that can do so without materially harming those at the opposite end of the financial spectrum. It does mean a fight against selfishness, greed and uncaring. March 19, 2014, 11:57 a.m. The leftist apparatchiks are running the inequality propaganda machines overtime. Now, even NASA is weighing in on the relationship between inequality and the decline of civilization. It seems they are getting out of their orbit. Of course, this is from a bureaucracy that for over forty years has not figured out how to get humans out of low earth orbit; literally flying around in circles the entire time. There is much commentary about how inequality has a bad ending. Sounds reasonable on the surface. But, it seems the real issue is how “inequality” is mitigated or at least reduced. Most of the top down centrally managed solutions embraced by the left did not stand the test of time and collapsed. Not to mention required the facilitation of many bullets with much blood letting and starvation. Even the much vaunted social democracies of Europe seem to require predatory merchantilism or gobs of cheap debt from foolish lenders. Neither of which can last. Their are some obvious problems such as the finacialization of our economy that rewards the few while giving them too much politcal influence, trade policies that punish our workers, a bizarre immigration policy/non-policy that limits the talented and admits the less than talented willy-nilly thus creating more competition at the lower wage scales. And, of course the dismal condition of public education. Plus, we seem to be hellbent on subsidizing and incentivizing (encouraging) numerous social pathologies such as out of wedlock births, the demise of marriage, indolence etc., etc. All, of which militate toward poverty. And, I will toss in the outsize share of GDP that corporate captains seems to command at the moment for questionable performance; hopefully, this will mean-revert. But, one thing most of us seem to skirt around is the unpleasant fact that maybe too many of us from the perspective of production are simply superfluous. And, maybe this is a partial cause of “inequality”. For obvious reasons, I don’t think I will pursue this line of thought too far. But, it is sobering. March 19, 2014, 7:58 a.m.
Economic growth comes from increasing productivity. Outsourcing, downsizing and consolidation increase economic productivity but it strips income out of the middle class. Period. Yes excessive Government regulation, fees and procedural hoops play a very large role but that’s not to say that all regulation is bad. Getting your deck inspected and obtaining a permit seems to be a logical necessity in the long run for all. Economic growth comes from consumption which is fueled by rising incomes, savings or credit. Long periods of falling or stagnant real wages decreases savings (long and short run) and increases credit expansion. The point is most things are bought (with the exception of Lexus cars, Coach purses and Le Creuset cookware) by the bottom 90%. Take away their purchasing power and the economy stalls. Giving them cheap credit and then blaming them for lack of discipline is actually pretty hilarious. No “serious reader” can really take your comments seriously, unless of course your blinders on on. Just curious. How many economic empires failed because they were too nice to their citizenry? Seems to me, historically, the debilitating amounts of debt that take down empires is due from military extensions. Just saying…. One last thing that the Professor brings up that gets my crawl. Our school systems are fantastic. Education starts and ends at home. We have two family income earners and many of them are working two and three part time jobs to make ends meet (and pay down that debt they so carelessly built). Trade offs must be made and unfortunately it is often at the expense of our children. Anyone that thinks implementing school vouchers as a “solution” to our education dilemma is delusional. I am in the top 1% and consider myself an economic conservative. I also consider myself an economic realists. I would not call myself a neo-Keynesian by any means but most people fail to remember that Keynes believed Government debt MUST be paid back during the good times. Clinton and Gingrich realized this but the rest of them haven’t picked up on that. March 19, 2014, 7:21 a.m.
Good for you. This is an important topic and must be presented. Capitalism is very akin the game of monopoly. At some point, you have to give the rest of the players money if you want the game to continue. March 18, 2014, 10:03 p.m. I thought the world had already done the inequality experiment which ended in abject failure. It was called “communism”!!! Those states still buried under it’s yoke are starting to dig themselves out from under it before their entire world collapses from it as did the Soviet Union. See China, Cuba and hopefully soon, North Korea. March 18, 2014, 4:06 p.m. Permit me to write on by far the most basic fallacy regarding Income Inequality—the analysis of the whole rather than the componnt parts. The economy is not a singular beast. In order to properly analyze Income Inequality we must look at each part of the economy and its contribution to growth and GDP. I submit that economists are loath to do that when aggregate information is available and the calculations reach the end which suits the their predisposition. I have communicated with you similar bias among professionals in failing to calculate the size and extent of the Gray Market and thus its effects on GDP on the one hand and movement within the deciles on the other. When aggregate data is available on the surface, why bother to mine? It is clear that an economy, composed of several known sectors. does not advance in lock step in each of the sectors. It is clear as ell that an economy is not a closed loop, peculiar to single nation. I suggest that the median income in the Finance Industry is not equal to that in each of the other parts of the Private Sector or of the Public Sector. If this is so, the decile income groupings would not be at the same levels. When a product is exported and revenue flows to that Industry from outside the country, the revenue, and thus the income does not lessen the income levels in the remainder of the economy but adds to it bothe directly and as a multiplier. However, if you aggregate across all of the economy the individual incomes it becomes clear that you do not have economic analysis but political chopped liver. GINI fails the smell test. March 18, 2014, 3:35 p.m.
China gets it, increase supply of labor, keep wages down, destroy any burgeouning labor bargaining power; it’s so strange that a communist country is such an ultra-capitalist. 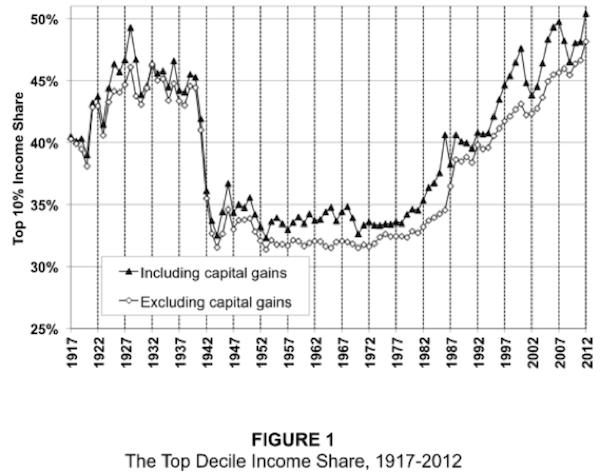 As the supply of labor increases expect even worse inequality where the owners of capital reside. Not everyone can be above average; not everyone can become an engineer or computer scientist. Real wages for the bottom 10 or 20% in the US continue to converge upon a global mean. Extreme income/wealth inequality will eventually lead to rampant corruption at public services (police, fire, ambulance, hospital, DMV, education), illegal activities, and kidnapping/theft. 12 foot metal fences with barbed wire up top, enclaves, just travel a few hundred(or thousand) miles south to Mexico and see what it looks like. I don’t know if this is clear, this is what happens in countries around the world where inequality is very high—and the wealthy end up leaving those countries and coming to the US (and others), what are they going to do when the US is just as dangerous? Huddle up in Singapore, Hong Kong, & London? Yep. Renounce their US citizenship? Yep. IF our political and economic policy is leading inexorably towards such a scenario, is that not treasonous? This is a nation and while a bigger government is not the answer, a living wage for those on the lower income part of the scale is in the long-term interests of this country. I actually oppose redistribution, large & too-powerful government, but how can this be remedied if not by business owners and capitalists? 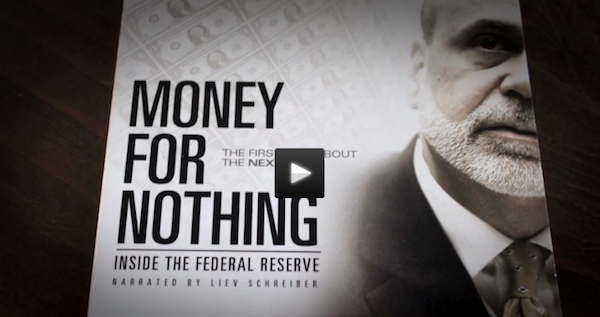 If the government does it you’ll get monstrosities like FBAR, ACA, FinCen 144, GSEs, across the board min. wage raises, Social Security, underfunded & overly generous pensions. Businesses and owners need to lead the way and show that there’s a better way. Is that naive? March 18, 2014, 1:50 p.m. I have been reading your letters avidly for the last six years. These last two provoke me to comment because I think you are missing a few points. If the global population was a corporation, I wonder what you would say is the ‘mission statement’. The greatest good for the greatest number for the longest time? I think that would make a great topic for a future letter. I wonder if you could comment on the following points. 1. Savings equals investment. But there is good investment and bad investment. Bad investment is speculation in property, stocks, currency. I would hypothesise that the 1% focus on bad investment - using their power ( as with high speed trading) to take money from the 90% or invest in political lobbying to bias things in their favour. Good investment used to be channelled through the banks combining the meagre savings of the 90% to create small business loans for entrepreneurs. 2. Government is notoriously bad at allocating investment. But any society needs an infrastructure - roads, railways, utilities, law and order, defence etc- which must be paid for through taxation. There is a legitimate debate to be had about the size of this investment and the allocation of the taxes, but lack of investment in infrastructure is a drag on economic growth. The best investment any individual or any country can make is in education- “give a man a fish and you feed him for a day, teach a man to fish and you feed him for life”. Government should ensure affordable high quality education for all. 3. As well as economic instability, the world faces three other major challenges right now - the rapid growth in population, the depletion of natural resources and climate change. The timing and degree to which each will become critical is debatable, but we can expect that within the next 30 years the combined impact of these trends will have a significant impact on growth in GDP/capita. 4. I can site no research to support this, but my reading of history is that civilisations collapse when the gap between rich and poor becomes unacceptable. This time may be different, but history shows resentment builds to the point where the masses turn on the wealthy. 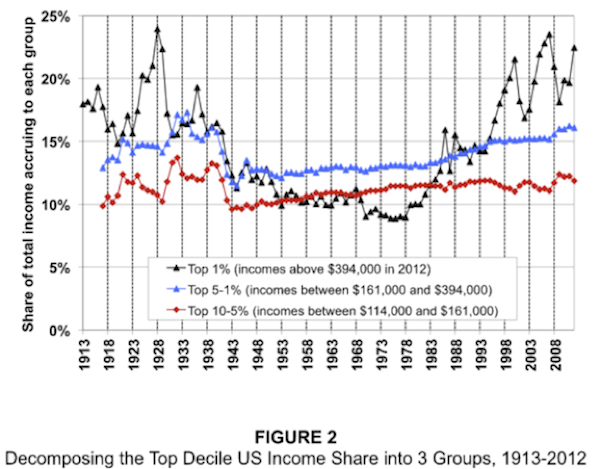 Income inequality cannot be ignored. 5. You refer to breakthroughs in healthcare as the next ‘industrial revolution’. I fail to see where the return is on this. The majority of the global population cannot afford to pay for healthcare, and if they did the impact would be increased lifespans which will make my point 3 above worse. Thanks for the letters - keep them coming! March 18, 2014, 11:10 a.m.
It’s all very simple - Teachers Unions vs. Students that the teachers educate. They have competing priorities so it should be no surprise that we’ve created this monster with our good tax dollars. The idea that any political party is truly interested in the well-being and advancement of U.S. students is absolute hogwash and they should be called out. In fact, 60 Minutes did a piece which touched on this a few years ago (dealt with the New York City public school system). One of the takeaways that has always stuck with me was the strength of the Teachers Union in NYC. How strong? Try this: since something like 1975, they’ve had more teachers die on the job than have been fired. Could there possibly be a greater example that the entire system desperately needs a massive overhaul? No wonder teaching is such a good gig. Reasonable pay, tons of vacation, great benefits and very little accountability for your actual performance.